The proper usage of Internet needs to restrict certain websites. It has been continuously reported that the children are using the social networking sites. Sometimes access to websites which are not meant for the small children might be harmful for them. So, elders would always prefer to block the unwanted websites to restrict the internet usage at schools and home. This is because it is not possible to check every time what is being used to computers. And using complicated softwares at home is not at all a good option. So, today I would like to review the utility called WebAllow which will allow access to the required websites only. All the other websites then the desired will cannot be accessed. WebAllow is a small freeware of 1.03 MB. The utility is designed to restrict the unwanted websites on internet explorer. Or more precisely speaking get access to the required websites only. The websites you have entered in the tool can only be accessed. Even if the webpage has the links to some other webpages, they cannot be opened. The user interface has been sown in the snapshot below. Initially few safe websites have been added. Click on Add Site to enter more which you want to access. The dialog box shown below will be presented to you. Now enter the URL and click on OK. Similarly, you can enter all the websites you want to open. After entering all the websites, you have to click on Block all the URLs except allowed. The work is done. You can add the websites later if there are some more required websites. But the utility will be of no use if anyone can enter the websites. 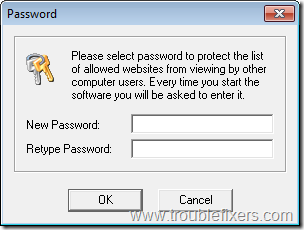 So, I would suggest to set the password to access the freeware. It very simple. Click on Password and set it. There is a small problem with the freeware. If you want to access a large number of websites. The tool proves to be quite problematic to enter the whole list. Moreover since the link to new websites can’t be opened, the usage becomes very limited. So, the tool is useful when only few websites are to allowed. Few of the useful options are: the small kid’s computer, office system where you want only to access the company website and other such places. So, just install the freeware and enter the websites. You will be free about the internet usage thereafter. The freeware has been tested with Windows 7 and is compatible with all the other versions also.